Here’s an image from The Unexpected Traveler and the text it illustrates. For more information, see the project page. The enormous Drogo the Dragon. Art by Loretta Casler, www.aldea-art.com. “Something’s flapping up there. Something big,” whispered Heinrich. “What is that?” I asked, pointing up into the moonlight. An enormous black shape drifted about, periodically flashing with yellow light as though a dwarvish airliner. Rainier quietly got out of bed and drew his sword. Heinrich and I ran to calm the horses. It appeared to be an enormous bird, far larger than anything I’d ever seen. Whatever it was was black and therefore hard to make out. When the yellow light flared again I could see that it came from the beast’s mouth. The gigantic bird swooped silently across the meadow and grabbed a sheep, which screamed its death agony. The mysterious beast flapped back up into the moonlight, coming around the edge of the meadow in our direction. The sheep struggled in the beast’s claws. The beast let go of the sheep, which plummeted a good hundred feet and hit the ground perhaps twenty feet from us. It convulsed and lay still. The gigantic beast wheeled around and landed, lighting its own way with flame. I was surprised to see that it stumbled on landing, but it quickly found its prey and began to eat. We could hear bones snap and the great beast rustle its wings. Rainier stepped backward and fell over a root. He was warrior enough not to cry out, but his sword clanged against his shield and his armor jingled. The beast turned immediately to face us. It puffed a quick flame in our direction that smelled like unwashed socks. Seeing us with its enormous black eyes, it turned and reared. It had alligator-type skin and was at least fifty feet long. The wingspan was closer to sixty feet, maybe more. As it puffed up its wings and stood on its talons—a move that frightened me to the core—it moaned involuntarily and stumbled, falling flat on its face not ten feet from us. A fireball shot forward as it hit; I had to jump out of the way. As it was it hit one of my bags. I rushed to put out the fire. 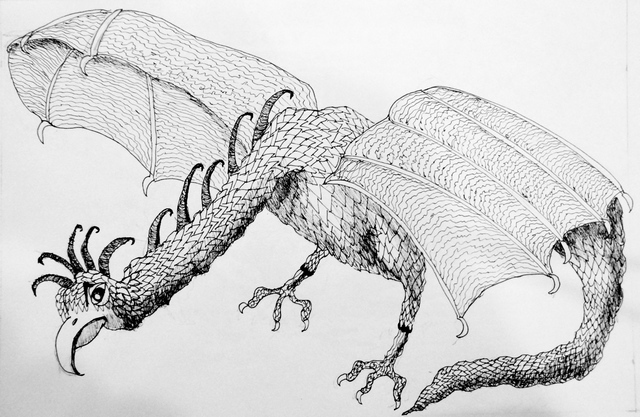 “You’re…you’re…you’re a dragon,” I stammered as I climbed to my feet. This entry was posted in Fantasy, The Unexpected Traveler. Bookmark the permalink.